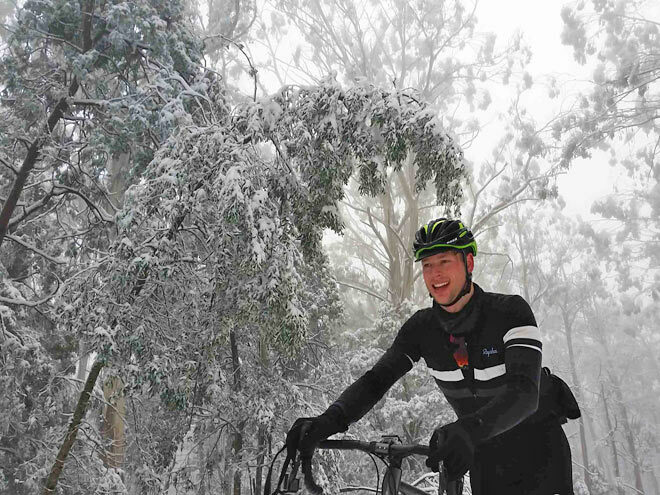 For Brendan Edwards the inspiration came from a photo published by COGS cafe of a mountain bike ascending to the top of Mount Donna Buang in a sea of white; it was just one of those photos that made you wish you were there. 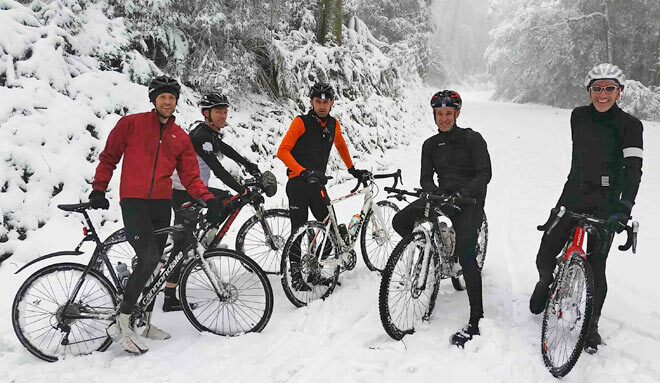 The photo was sent to Brendan’s mate the night before and so began the adventure to ride up to the snow. 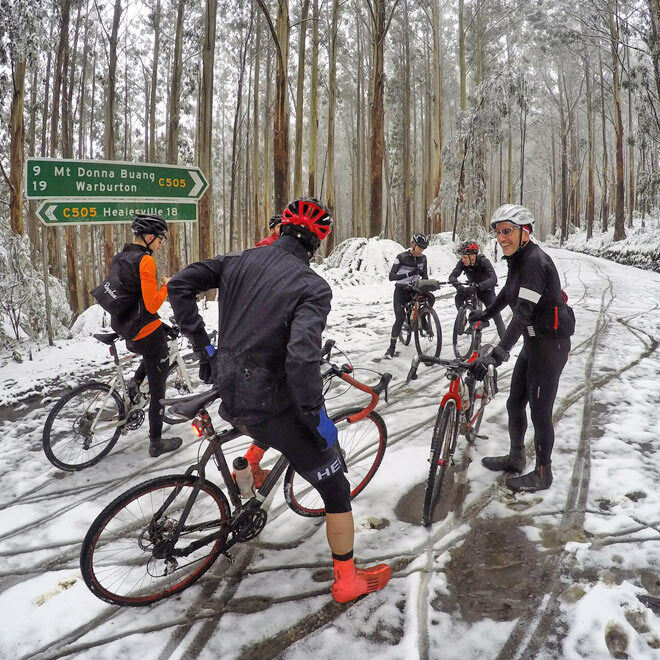 As it turned out, another group comprising of riders from the Hells 500 group also has the same idea on the same day, previously being involved in many ‘Everesting attempts’ and other crazy rides. 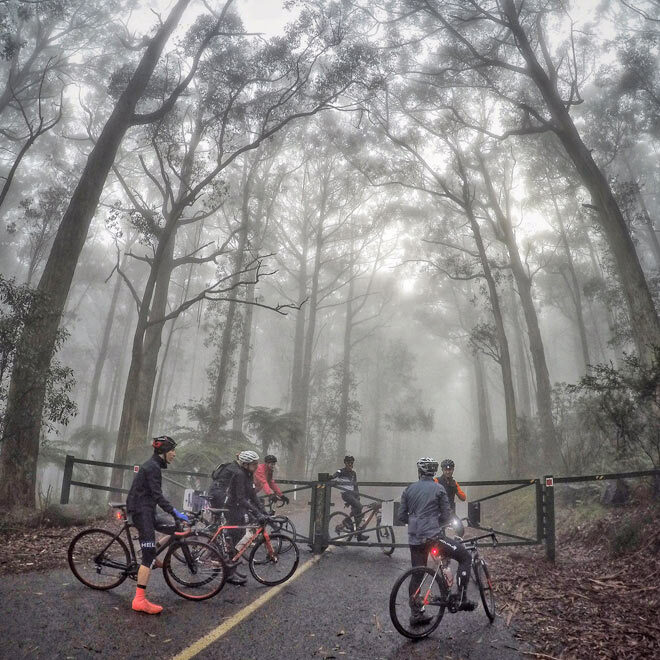 The route taken was first made famous by Andy Van Bergan from the Hells 500 with an annual event called ‘Old Dirty’ which he started in the Yarra Valley. Before this time not many people knew that this climb ever existed nor would think or consider dirt riding on road bikes. 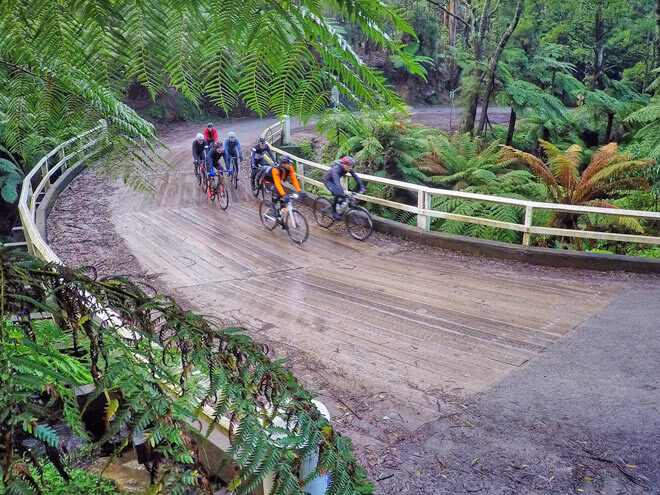 In total, the climb is 25kms in length and generally the road is graded by VIC Roads. At the 12km mark a gate is closed off during the winter months. The last 13kms offer a unique experience in itself knowing that you are not going to see another car and being technically challenged as the road isn't maintained during this period. All matter of debris falls on the road including, trees, branches, twigs and rocks; you just never know what to expect. There are amazing waterfalls and greenery meaning you will be constantly overwhelmed by this amazing scenery. 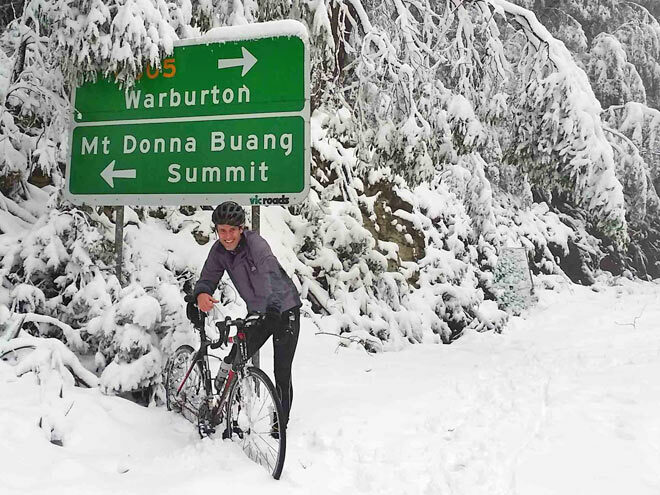 For the last 6kms, the snow was 4” thick which was rideable without being too challenging until it got to 6” thick and the road froze over. At this point you couldn't ride the bikes any more so it was a slow grind to the top pushing the bikes. It was 2kms before the turn off to the summit which was incredibly hard. 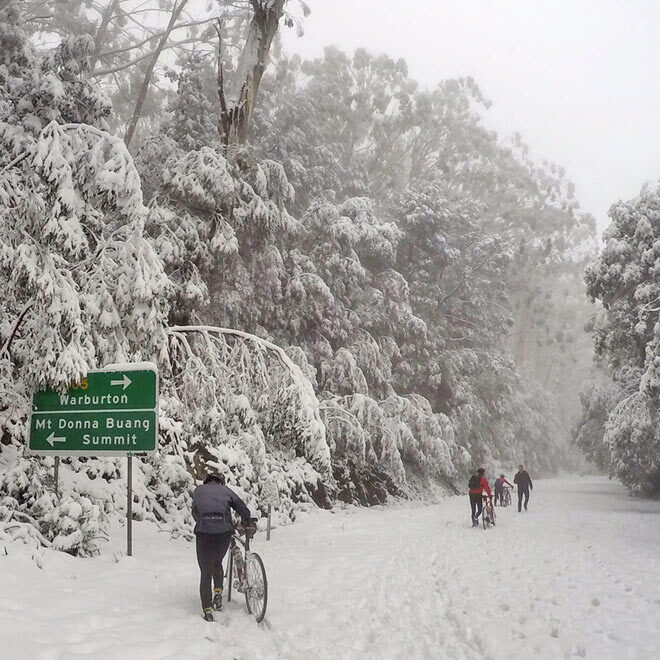 It was actually blinding to ride through but absolutely amazing to ride when it was snowing; it was fluffy and just an incredible experience. The summit was reached in 4 hours and although there were many photo stops along the way, the average was a crawling 6.3km/h which pales into insignificance when compared with their 1.20 pace during the summer months. 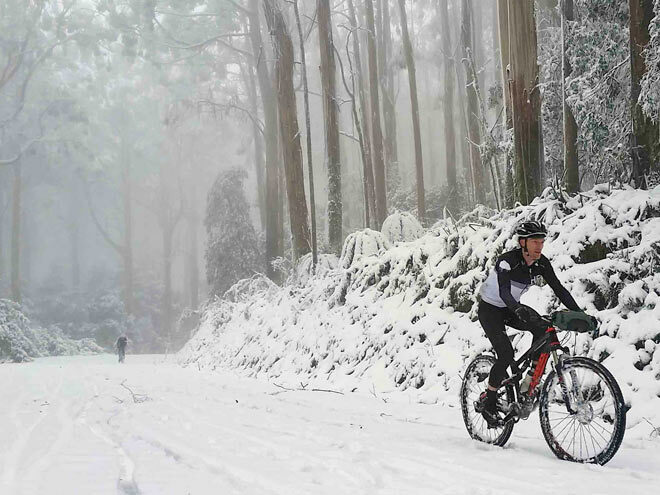 While Brendan’s mate had a CX (Cross Country bike), he had to contend with a road bike with 28” slicks on the back, which was fine until the snow deepened and it was just constant wheel spin. The trick was not to change directions; it was like normal riding but with an extra bit of pressure under the wheels. Initially Brendan was in shorts and t-Shirt until the start at the gate with additional layers being added to the top (4 layers in total) and just leggings with shoe covers. 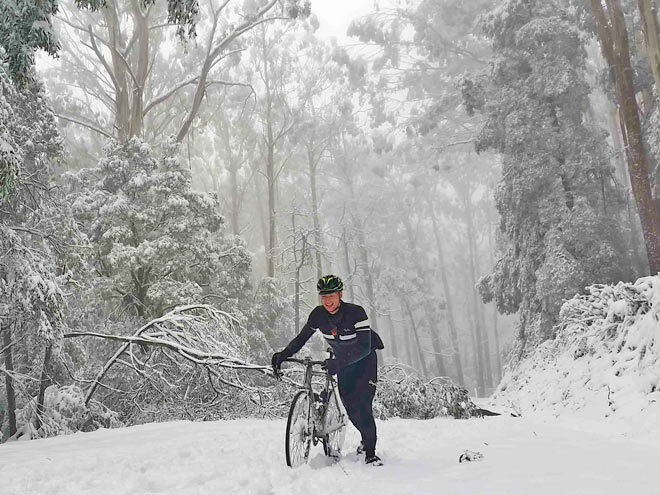 Before you undertake such an adventure, always ensure you are adequately prepared with clothing, spares and most importantly, have the experience to ride in cold conditions, i.e. sub-zero temperatures. Most importantly, watch the descent as this can be the most treacherous part, follow the right lines and be familiar with the road. 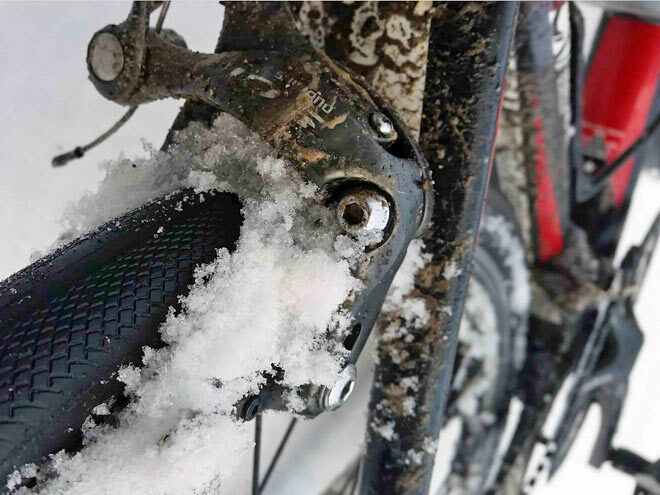 The ice on the road will generally be closer to the summit so remain safe and walk the bike if necessary. Make sure you go in a group and that someone knows where you are going and when you will be expected back. While many may feel they cannot do this ride as its nuts, the adventure seekers would take this as a challenge and ask themselves how do I do this? “It comes down to whether you want to live your dreams or just dream”. 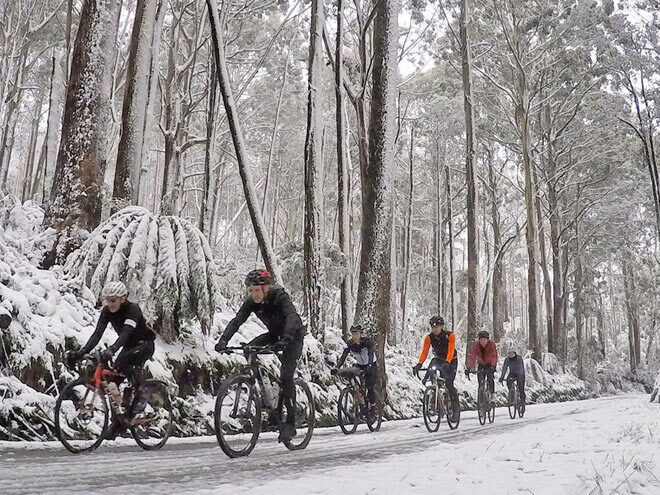 Over the next few months (July and August) the temperatures will stay relatively cold so there are still plenty of opportunities for riders to experience this for themselves. By pushing yourself and leaving the comfort zone, these magical experiences can be reached. Similarly, hikers and bush walkers have comparable experiences but in the process they do go through the challenges to reach this nirvana. For Brendan it’s more about going to the unknown and finding new places to ride. In the coming months this exploration will take him to the northern section of the Dandenongs. Part of the appeal is finding places that cyclists have never ridden before, there is danger in not knowing if you get punctured tyres (get stuck) but it’s all part of the experience and something that cannot be described.